This is a link to download a CD of a recording of the Grand Forks Master Chorale recorded at Holy Family Catholic Church, Grand Forks ND. on May 12, 1984. Te Deum K. 141. W.A. Mozart. Ave Maria. Tomas Luis de Victoria. O Heiland Reis Die Himmel auf. Johannes Brahms. Beautiful Saviour. F. Melius Christianson. Jane Solberg, alto. The Grand Forks Master Chorale and Orchestra is conducted by Dr Terry Eder. Donna Rohrer, soprano. Carol Irwin, mezzo soprano. Kathy Murphy, alto. Bradley Almquist, tenor. Paul Boese, baritone. Original recording by Dr. F. Mark Carter for radio broadcast on KFJM FM. Digital re mastering and CD compilation by Dr. F. Mark Carter. If you click on the hyperlink below, a zip file with the Flac encoded wav. files, cue file and instructions for burning the CD will download. You can also play theWav. files with a player that supports Flac such as Winamp. This is a large file and will take about 30 minutes or so to download depending on connection speed. Here again is the hyperlink to the 1984 concert. The Magnificat was recorded on a Revox A700, the other items on a bespoke Brenell Mk 610 with Brenell Stereo tape link. To make the edited analog master the tapes were played back on the Brenell Mk 610 and dubbed to the Revox A700 for razor blade editing. 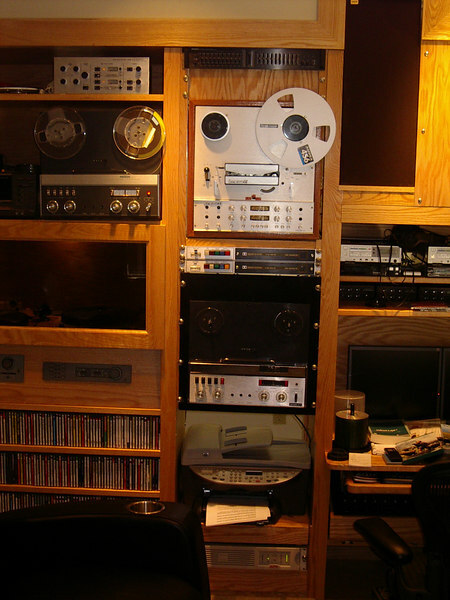 The tape was Ampex Grand Master running at 15 ips. DBX 1 noise reduction was used and there was no dynamic compression at any stage. I could just master this to CD using all the bits. The microphone was a Neumann SM 69 FET auditorium microphone. Subtle use was made of AKG microphones on the soloists. 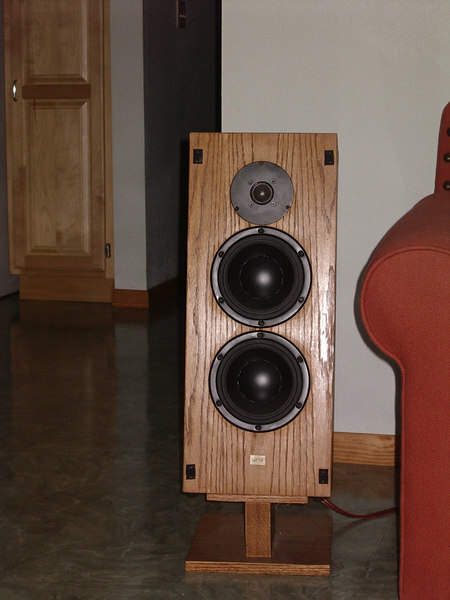 The Monitor loudspeakers were CARTER NFM-1. Two and a half way sealed enclosure with two Dynaudio W-75 EX and Dynaudio D 28. Here is a picture of a CARTER NFm-1 loudspeaker.